These lines follow the moving average and move toward or away depending on trade volume. 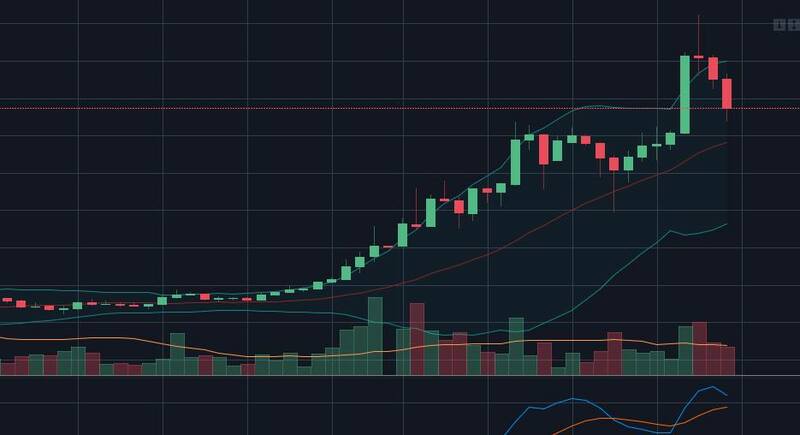 On this chart you can notice as the volume goes up (the vertical bars at the bottom) the upper and lower bollinger bands move away from the moving average. How is this useful? These indicators aren’t real-time as they depend on previous trade information in order to be drawn but you can use them along with other indicators to determine how a specific chart is trading. You can use the upper and lower bands as support/resistance indicators. Movement across the middle band, the moving average, is a pretty good indicator of how a coin will act. In this image you can see the candles reach down to the bottom b-band and bounce up toward the moving average. It tests breaking the moving average 3 times before ever touching the bottom band again. This is a pretty good indicator that the coin is trending up.